Well, Escape Plan would have been a big letdown if I had any hopes for it at all. Fortunately I went in with very low expectations and was moderately entertained. The trailer looked pretty cool when I saw it the first time, which was months ago, now I’m not sure what I saw that interested me. I should have been able to see right through this one… But, it is one of the “big” releases this week, so I felt I had to watch it so I could say what was going on at work. Sylvester Stallone plays Ray Breslin, a man who makes his living finding the deficiencies in high security prisons by escaping from them. He is hired to break out of the un-escapable “Tomb”. He’s kidnapped, thrown inside, and his evacuation code doesn’t work with the warden (Jim Caviezel). His team on the outside can’t track him and monitor his safety either. 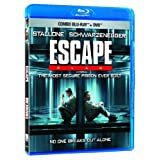 This time he’s on his own, until he meets Emil Rottmayer (Arnold Schwarzenegger), a man being held by the warden until he gives him the location of a man whose capture would make the warden rich. The movie plays out less as an action thriller and more as a “puzzle” movie, as the filmmakers called it in the special features. It played out to me like a slow movie. This one had no business being almost two hours long. There were scenes that were just so slow to me that I had to speed them up. Watching Stallone walk down a corridor, and then having a very predictable “Stallone” style fight with Vinnie Jones was just a bit too much for me this night as I was already tired and starting to feel under the weather. The nice thing about watching DVDs on the PS3 is that I can hit the FFWD button and it plays at 1.5 times the regular speed but still plays the audio (sped up of course). The supporting cast wasn’t very supportive, but that could be because they weren’t really given much to do. Caviezel’s Warden Hobbes was flat and uninspired, and the identity of “who set Breslin up” (and threw him in jail) was so obvious, this was a “puzzle movie” with only one piece. Even the special effects didn’t look that special, as some scenes of a tanker ship on the water looked incredibly CGI-ed. Stallone himself looked puffy. That’s the only way I can describe him. I don’t know if it’s the HGH or whatever else he’s pumping into himself, but he looked awkward and disproportionate (especially around the face and shoulders) for someone who at the same time looks to be in good shape. I can’t believe I’m saying it, but the lone shining star in this film was Schwarzenegger’s acting. I actually liked his character and his portrayal. After watching Last Stand, I do think that Arnold is actually acting his age. His characters are older, as is he. He’s not taking on super action packed fights, and when he does fight someone in this movie, it’s either in a crowd or riot setting or a staged fight with Stallone’s Breslin. Seeing 66 year-old Arnold fighting 67 year-old Stallone doesn’t come across as badly as seeing 67 year-old Stallone fighting everyone else. Stallone gets the bulk of the action in this one, but Schwarzenegger does get to pull the machine gun off the rescuing helicopter which feels like a “classic” Schwarzenegger scene, and is a nice nod to the actor and his fans. Bottom Line: It wasn’t horrible, but it wasn’t all that entertaining either. If the choice is between Escape Plan and going to bed early, take the extra sleep. The Last Stand, Arnold Schwarzenegger’s big return to action movies did not disappoint. Well, it did not disappoint me at least. I went in not really expecting anything. I’ve never been a big “Ahnold” fan, I think I’ve only seen 11 of his movies (Conan the Barbarian, Terminator, Terminator 2, Running Man, the last half hour of Predator (on TV), Twins, most of Kindergarten Cop some of Last Action Hero (again both on TV), Eraser, True Lies and of course Hercules in New York), but what I did see, I enjoyed for the most part. 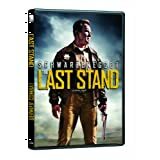 I went into The Last Stand thinking that Arnold’s “return to action” could be a lot more believable than some of the other aging action stars, and I think it was. 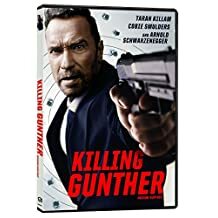 Most of the action came from shoot outs and car chases, and while there was a final fight showdown between Schwarzenegger and the main bad guy of the film, I had enjoyed the preceding 100 minutes enough to believe that our hero could hold his own in a fight with the much younger villain. Arnold still looks to be in good shape; not crazy shape like Stallone who seems to have replaced his skin with some alien substance. What makes his fights in this movie believable are that they are just “one on one” fights, it’s not Schwarzenegger beating up a band of ninjas, or fighting off a horde of bad guys; he beats up one guy at a time, and as he is still a pretty big guy I can believe that this could happen this way. The plot of the film is not too complex, the leader of a drug cartel escapes federal custody and steals a souped up Corvette to make his mad rush escape back to Mexico with an FBI Agent as his hostage. Outrunning the police (in some pretty cool car chase footage) he heads for a small border town to make good his plan. After defeating SWAT Teams and helicopters, how difficult could one small town sheriff be? Of course when Sheriff Ray Owens is no ordinary sheriff. After retiring from the LAPD elite drug squad after a failed operation that left him the only survivor of his team, Ray settles in the sleepy border town of Sommerton Junction. I think this was key to the whole premise of the film and what made it plausible. Seeing the small town sheriff take on drug lords out of nowhere is a little unbelievable, but given this small piece of back story, there is just a lot less disbelief to suspend. He obviously had the skills so defeating drug lords again makes sense. Of course Ray can’t do it on his own, he has his deputies Mike “Figgy” Figuerola (Luis Guzmán) and Sarah Torrance (Jaimie Alexander) and deputizes Lewis Dinkum (Johnny Knoxville) the crackpot owner of an artillery museum and Frank Martinez (Rodrigo Santoro) a former military man who seems to be hitting bottom but could probably turn his life around if given a second chance by somebody. Rounding out the cast were Genesis Rodriguez as FBI Agent Ellen Richards, Forest Whitaker as head FBI Agent John Bannister and finally Harry Dean Stanton as the crotchety old farmer/milkman, Mr. Parsons. Sure, The Last Stand is full of cliché moments and characters, but director Kim Jee-Woon’s (The Good, The Bad and the Weird) first American film was still a lot of fun.